INTRODUCTION: Olive oil has been a staple in the Mediterranean diet for millennia. It has become exceedingly popular in the United States, not just because of the growing appreciation of its fine flavor, but because of its medically researched impact on cholesterol levels. Not only are our store shelves filled with wonderful oils from around the world: California has hundreds of entries and its own olive oil council to market California oils to world markets. This has resulted in the availability of a wider range of olive oils in most areas of the country. However, along with choice comes disparity in definition. While most countries use the standards of the International Olive Oil Council (IOOC), two formidable entities, the European Communities and the United States, do not, each using still other standards and definitions. The California Olive Oil Council (COOC), working apart from the United States Department of Agriculture (USDA), has attempted to protect its crop by issuing a seal to oils which exceed IOOC Extra Virgin olive oil quality standards: its products surpass global standards. There’s a lot of information about olive oil and olives here. If you think we should consider terms or definitions than those we have provided, use the Contact Us link on this page . Also read our article, Flavors and Aromas of Olive Oil. Also visit our collection of almost 100 food glossaries to learn more about other food products. The natural acid in olives is oleic acid. If the acidity of the cold-pressed oil is less than 1%, it is known as extra virgin olive oil. If the acidity is between 1% and 3.3%, the oil is called virgin olive oil. Any oil obtained from the first cold pressing that has a natural acidity above 3.3% cannot be sold as virgin olive oil. It is usually sent to a refinery to reduce the acidity and eliminate any other objectionable qualities in aroma and flavor, and is sold as “olive oil” or “pure olive oil,” a refined product. A large dark purple or black Greek olive. Brine-cured, it has tender flesh and an earthy, slightly tart flavors. It is used in tapenade spreads, meat stews and red sauces. Serve this olive with Pinot Noir. One of the main Spanish olive varieties, grown in Catalonia in northeast Spain, and other areas. The small, brown olive produces an oil that is very fruity and fresh, with a smooth, fluid mouthfeel, nuances of green almonds and fresh-cut grass. It is often used in blends to provide the “fruity” notes. It is perfect for vegetable or meat marinades where flavors are more subtle. It is also enjoyed as a table olive. with a slight apple taste, green grass, not very bitter or pungent, and of a sweet flavor. It has medium-low stability, i.e., it does not retain its freshness for long, so buy it in small quantities and don’t let it linger on the shelf or it will go rancid. Arbequina trees can be purchased from Olive-Trees.net. A term for condiment oil: an extra virgin olive oil with fine flavor and aroma that should be used as a surface accent, and not for cooking or baking. Appellation d’Origine Controlée, the French certification of authenticity of origin. Italians use D.O.P., which stands for Denominazione d’Origine Protetta (some other countries in the European Union also use D.O.P. now, including Portugal), and the Spanish use D.O., or Denominacion de Origen. As opposed to blended olive oil, a term given to an oil from a single estate, or made from a single variety of olive, which produce a superior oil. These single-estate oils and artisanal oils are among the world’s finest, and are made in very small quantities. See also estate oil. 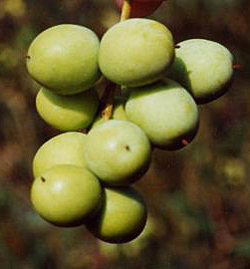 A large light green olive native to the Marche region of Italy. 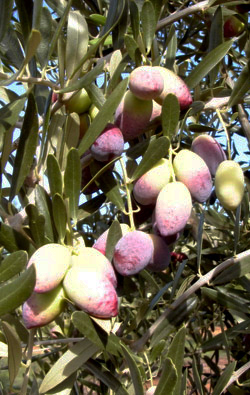 The Ascolano is notable for its huge size, and is often served as an hors d’oeuvre olive. It has a soft flesh and delicate taste. The Barnea is a modern cultivar bred in Israel to be both high-yield and disease-resistant; it is also grown in Australia and New Zealand. It is used both for oil and as a table olive. The oil has a pronounced, leafy green flavor. A medium to large round table olive from Tunisia, Africa. The olives have a fruity flavor and a slightly bitter taste. A black olive is a fully ripe olive, and will contain more oil than a green olive. 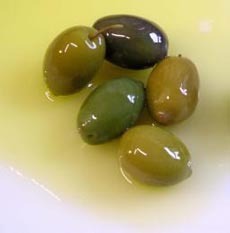 Whether ripe or green, the olive fruit is naturally is very bitter and not palatable; it needs to be fermented or cured with lye or brine. There are different techniques—see curing, Picholine and Spanish olives. Green olives are allowed to ferment before being packed in a brine solution. Domestic mass-marketed black olives are not fermented, which is why they have a milder flavor than green olives or imported black olives. IOOC Definition: Most supermarket brands of olive oil are blended from oil from many different varieties, regions, and even countries. (1) Because olive oil from the same grove tastes differently from year to year due to weather, to create an oil that tastes the same blenders must take oil from many sources and come up with a recipe to create the same taste. (2) Blending some oil high in polyphenols with one which does not will increase its shelf life. (3) Sometimes olive oil is blended with canola or other vegetable oils. This should be stated on the label. Illegal blending of cheaper oil can be profitable for the unscrupulous and can be difficult to detect. Many of the name brands sold in food stores in the United States (and in many other parts of the world) are a blend of bulk olive oils from one country or several countries. For example, a leading brand of virgin olive oil may contain a blend of virgin oils from Spain, Greece and Turkey; or a bottle of extra virgin oil may contain a blend of extra virgin olive oils from different regions of one country, such as Italy or Spain. The label will usually designate the origin of the oil blend. The blending of different batches of olive oil of the same grade does not indicate that the product is inferior, but it allows the manufacturer to sell the product at a reasonable price. Many blended olive oil brands are among the most popular. As opposed to estate oil, larger producers enjoy economies of scale which permit them to offer an excellent product at a more affordable price.